AMPA-type glutamate receptors are found in the postsynaptic membranes of our central nervous system. They play one of the main roles during excitatory synaptic transmission in the mammalian brain. When a neuron is firing, an action potential initiates a release of neurotransmitter glutamate (Glu) into the synaptic cleft. AMPA receptors are the first proteins to “record” Glu release: their large extracellular domains protrude almost half way across the synaptic cleft where they bind Glu. In response to the binding event, AMPA receptors open their integral ion channels (1), allowing influx of Na+ ions and resulting in depolarisation of the postsynaptic membrane. If the stimulus is strong enough, the postsynaptic neuron will fire, propagating the excitatory signal through the neuronal network. The molecular composition of our synapses varies with their activity. For example, synapses that are used repeatedly, through cognitive processes such as memory formation and learning, have higher number of AMPA receptors. Recruitment of AMPA receptors in and out of the synapse is, thus, one of the main molecular mechanisms used by synapses to strengthen or weaken the transmission. AMPA receptor movements occur at length scales not accessible using conventional fluorescence microscopy. For this reason, super-resolution microscopy has been utilised to visualise them at the nanometre level (2). Such methods require AMPA receptors to be labelled with bright fluorophores such as quantum dots, fluorophore-carrying anti-AMPA receptor antibodies, fluorescent proteins, or similar. 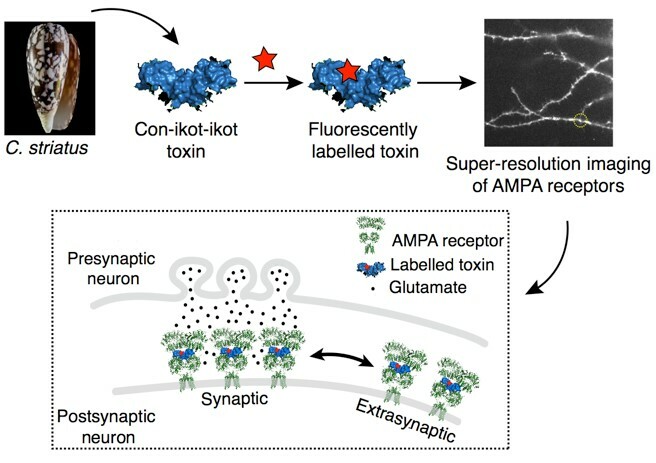 These labelling techniques either require genetic manipulation of AMPA receptors (insertion of fluorescent proteins or tags) or rely on labels whose size cannot easily fit into the confined space of the synapse already filled by the large extracellular domains of AMPA receptors (antibodies and quantum dots). Thus, there is a need to develop labels that can reliably report on the movements of native AMPA receptors between the synaptic and extra-synaptic parts of the membrane. This project draws on the “nature’s toolkit” to develop such a label. Its aim is to fluorescently label a naturally occurring peptide, called con-ikot-ikot, for use in super-resolution microscopy of AMPA receptors (3). The peptide is a toxin produced by a fish-hunting sea snail Conus striatus. When injected into the fish, the peptide binds to fish AMPA receptors causing them to over-activate which eventually kills the fish. Con-ikot-ikot is a tiny peptide (~20 kDa) which binds within the extracellular domains of AMPA receptors with very high (nanomolar) affinity. Coupled to a fluorescent dye, the toxin would thus, present a label that would bind to native AMPA receptors, without hindering their ability to move in and out of the synapse. It would allow us to investigate the movements of endogenous AMPA receptors in and out of the synaptic zone, as they respond to the activity of the synapse, a process fundamental to understanding how synapses regulate their strength. The project is highly interdisciplinary and offers an opportunity to engage in multiple biochemical and biophysical experimental techniques such as purification of the over-expressed toxin, its labelling with fluorescent dyes and use in the super-resolution microscopy. If you wish to apply for this project, please go this link.